Tannery Grade School Sixth Grade,1953 - 1954! If anybody know the questionable name or errors on the page, please let us know. Teacher was Mr. Husk, who was also the principal. Mr. Husk photo not included. 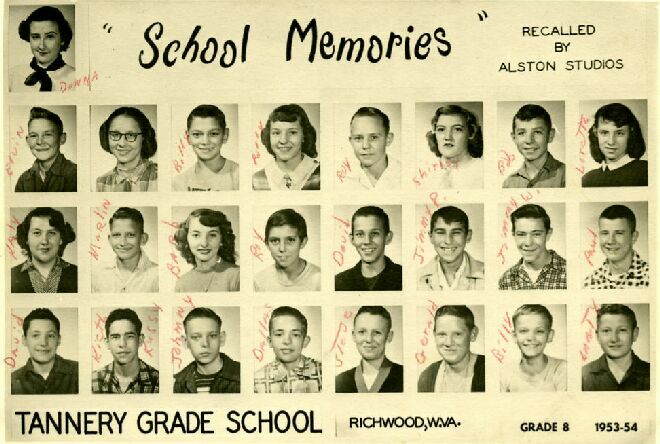 1953 - 1954 Tannery Grade School Eighth grade class. Missing name on row three #4 is Roy Phillips. Submitted by: "Gene Hall"
The missing name on Row 2 #8 is Loretta Sandy. Submitted by: "Elvin (Gene) Hall"